Sugar, Skim Milk Powder, Egg Yolk, Stabilisers, Flavouring, Salt, Anti-Foaming Agent, Colourings (Including E102). All food additives are of plant and synthetic origin. May contain traces of cereals containing gluten and soy. 2. 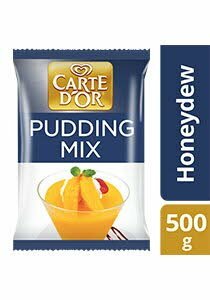 Stir in 1 pouch (500g) of Carte d'Or Honey Dew Flavoured Pudding Mix slowly until dissolved.